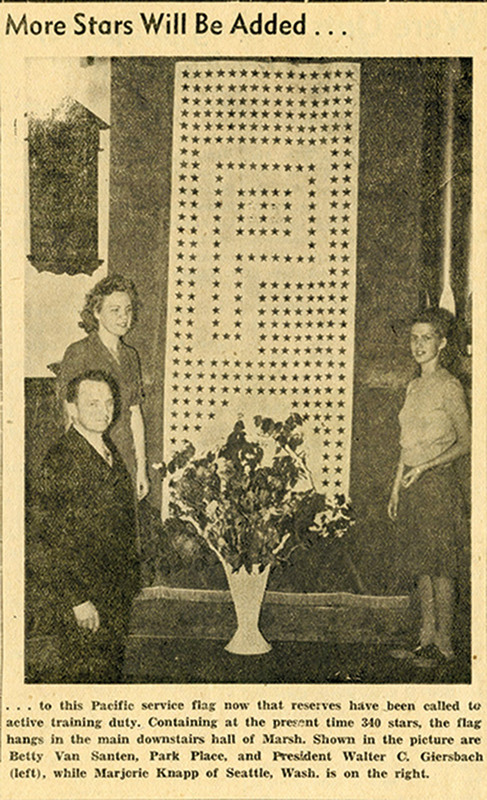 1943 Pacific Index, Betty (Van Santen) Mansfield '44, President Walter C. Giersbach and Marjorie (Knapp Coffin) Jones '45 with the service flag. In July 2016, staff in the Pacific University Archives completed a project to create the first digital inventory of artifacts held by the Pacific University Museum. Among the artifacts discovered in storage were Pacific’s service flag, a relic of the 1940s, when hundreds of students and recent alumni headed overseas to fight in World War II. Service flags were designed in World War I and codified during World War II. White cloth, bordered in red, featured blue stars for each loved one serving in the war. Blue stars were replaced with gold when a service member died. Pacific’s service flag represented the members of the university family in the war. Pacific Index articles announced the addition of new blue stars as students and recent alumni were called to service. A 1943 Pacific Index photo at the right shows Betty (Van Santen) Mansfield ’44, President Walter C. Giersbach and Marjorie (Knapp Coffin) Jones ’45 with the service flag. Adorned with 340 stars the flag was soon to get more with the activation of reserve forces. By later in the year, there were 394. This story first appeared in the Winter 2018 issue of Pacific Magazine. For more stories, visit pacificu.edu/magazine.